AMINEX IS INTEGRATING seismic acquired in 2009 to define the Kiliwani North discovery offshore Tanazania into reprocessed data, covering the remainder of the Nyuni licence. 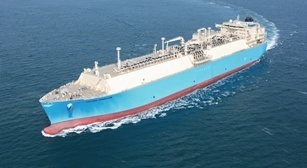 WARTSILA, THE MARINE industry's leading ship power system integrator, has signed a long term service agreement with Maersk LNG to optimise availability and operational economy. IN A RECENT interview, Victoria Oil & Gas' Executive Director, George Donne, said the company is targeting first sales of gas by mid 2010 at its Logbaba gas project in Cameroon. THE TRANS SAHARAN Gas Pipeline (TSGP) may feed African gas into the East European (Nabucco) gas line after it has come on stream in 2015. GHANA PLANS TO begin natural gas production from its offshore Jubilee field by the fourth quarter of this year for domestic consumption, according to Energy Minister Joe Oteng-Adjei.